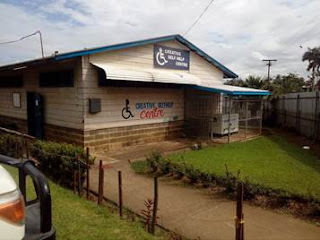 Freemasons in Papua New Guinea have come forward to help with upgrades at a local centre for children and young people with disabilities. Their efforts will help ensure the second and final construction stage – a double classroom – can begin. Madang Masonic Lodge No.380, with the support of Hand Heart Pocket, has donated AUD$6,000 to the Creative Self Help Centre. The centre is one of the only places of its kind in the remote northern province. It provides vital education and rehabilitation services for local children and young people who live with disabilities, empowering them to lead independent lives. “This is the first time Madang Masonic Lodge No.380 and Hand Heart Pocket have worked together to make a difference in Papua New Guinea. We hope we can continue working together for the betterment of local communities in Madang Province,” he said. As an independent charity founded by the Freemasons of Queensland, Hand Heart Pocket helps in areas of state-wide and local need that have limited access to other funding. We work with other charities to identify and fund initiatives that have real, life-changing potential. We also collaborate with Masonic Lodges all across Queensland and help individuals in times of extreme need to get them back on their feet. We use our funds wisely to give a hand up - to build potential, not encourage permanent dependence.